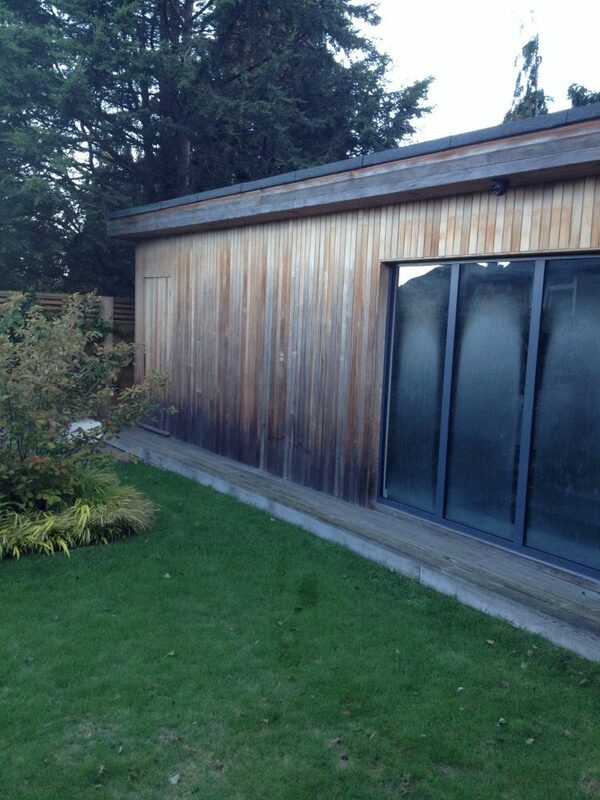 It never ceases to amaze us what a difference a new finish makes to wood cladding. Now they wanted to complete the look and were straight back to Owatrol products with the help of Roger! By using this powerful and fast acting wood cleaner and brightener, Roger was able to restore the natural color of the cedar cladding and decking and clean it quickly and easily. Before starting work, Roger masked off all the areas of the building which he didn’t want to be treated. Net-Trol is non-aggressive and is harmless to plants, so Roger didn’t need to worry about it damaging the grass next to the garden office. 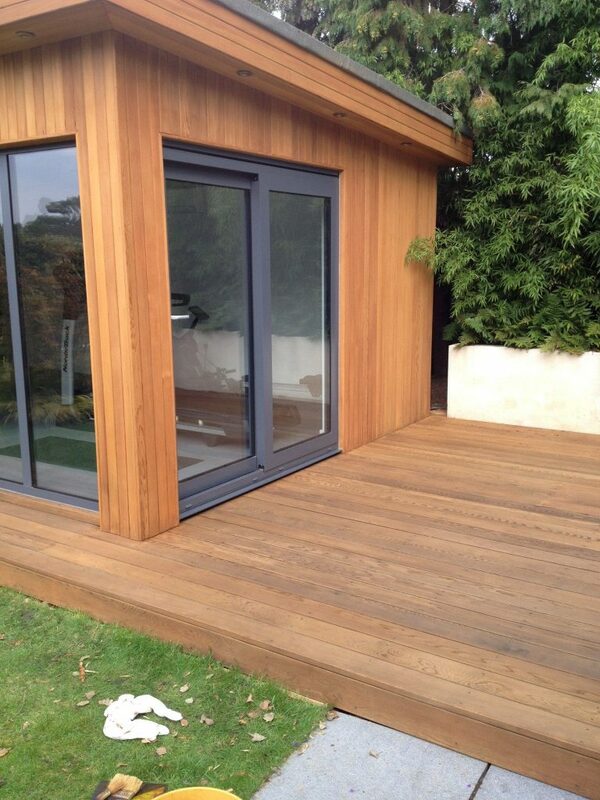 Firstly, he wet the cladding and the Southern Yellow Pine decking with fresh, clean water. They then applied Net-Trol with a synthetic roller and then scrubbed the surface with a stiff synthetic brush. After leaving it to stand for around 15 minutes, the customer then scrubbed the surface whilst simultaneously rinsing it with water (you could also use a pressure washer, max. 60 bar). If the surface starts to dry while you’re leaving the Net-Trol to do its magic, then simply mist it with some water. If you want, you can repeat the procedure but in this case, the client did not have to. 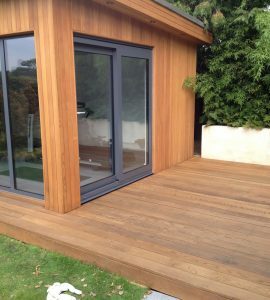 The customer then left the cladding and decking to dry for 48 hours before applying the finish. 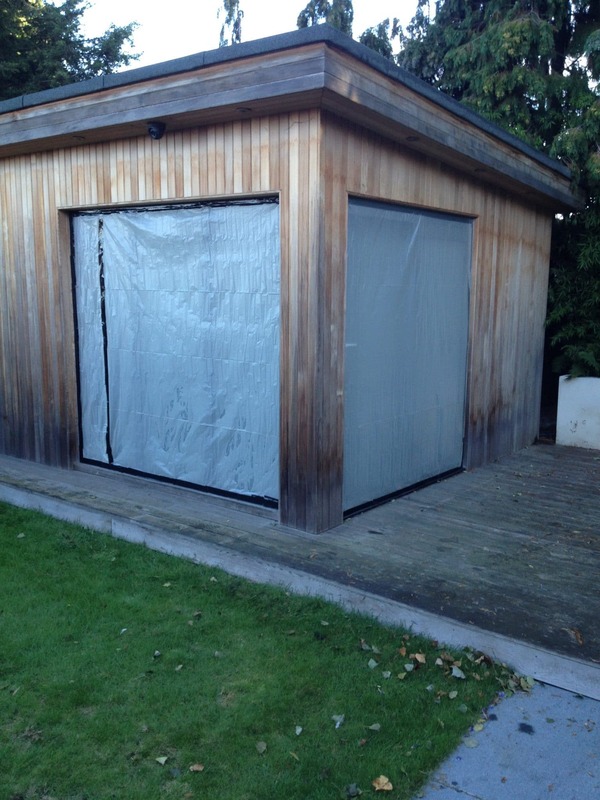 A water-based penetrating wood finish that provides advanced UV protection, Aquadecks was the ideal choice to revive and protect this customer’s cladding and decking. One of the great things about Aquadecks is that maintenance is easy, with no sanding or stripping required. Roger applied a liberal amount of Aquadecks in sections that he could complete within 30 minutes, working in the direction of the grain. After the ‘wet look’ of the first application disappeared, he then applied a second coat of Aquadecks and allowed it to penetrate for 15-20 minutes. Roger then wiped away any excess Aquadecks that had not penetrated (this avoided it drying in shiny spots on the surface of the cladding). Aquadecks comes in a variety of colors but in this case the customer chose a Honey tint, which we think looks stunning. By using Net-Trol and Aquadecks, Roger has given his customer’s garden office and gym a makeover that has brought the building and adjacent decking back to life. Have you used any of our products to makeover your home or garden? We’d love to see your photos!